Becoming a Christian is easy, to stay however one requires exercise. A Christian athlete needs to fast not just during Great Lent, but year round so when the fast comes his body is adjusted, and he will not end-up quitting after 2 weeks. He has to pray daily so when Sunday worship comes he doesn't complains about how long the service is or how difficult is to stand or kneel. The spiritual life of the Christians’ has been portrayed in many ways: a spiritual warfare, an athletic race, a narrow path and so on. All these depictions help us to imagine the unimaginable: how a humble and sinful creature can rise from the dirt and in the end be united with its Creator. This is indeed difficult to imagine taking into account the fallen state of man and the current state of the society in which we live in. .
St. John Climakos has developed such an image that we remember mostly during the Great Lent. 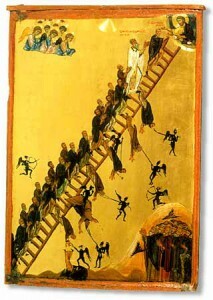 He is using as a model the ladder of divine ascent that was revealed to Jacob in the Old Testament. I am not going to go in a classic description of His method, you can easily find it in any book about Great Lent, but I will rather concentrate of discovering a deeper meaning of this divine “device” if you want to call it like this. . The first and necessary step in our journey is to define what type of ladder it is. Today we have in usage many types of ladders and devices assisting us to reach to a higher level: classic ladders, scaffolds, escalators, elevators and many others. To understand this better I will share a story. A few years ago I went to Mexico for a short trip and having a couple of days off I decided to visit the Shrine of the Virgin from Guadalupe, so much venerated by the Mexicans on both sides of the border. The first thing that struck me was the Church set-up itself. 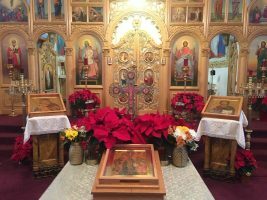 In the traditional Orthodox fashion you find the relics of a saint or any other sacred relics displayed in a very pious fashion, with a oil candle always burning by its side and generally situated in a prominent part of the Church so the faithful could venerate them with ease. . In this case the Church was anything but traditional. It was rather a modern building, looking like any American protestant church with chairs, stage and so on. 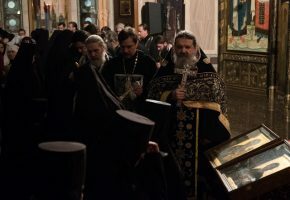 The relic itself, the shroud, was actually placed behind the altar in a sort of hallway through which the faithful have to pass to see it. But the most astonishing feature thereof was a moving sidewalk that runs in both directions in front of the shroud. So the faithful who come here could not even touch the relic, let alone kissing it as we are used to. Rather they would have to contend themselves with just passing in front of the icon at the constant speed provided by the electric escalator.. The reason I bring this up is that some Christians believe that the way to God is indeed like an escalator: it is enough to get on it and it would securely take you to your destination. It is safe, fireproof, waterproof, foolproof and nothing can prevent you from reaching your target. Sola fide, only believe and you’ll get there. All you have to do is enjoy the ride. . The ladder version of St. John Climacos is radically different. First of all it is not electric. If you want to go up you have to climb the stairs in the old fashioned way, one step at the time. This requires effort from our side, we are not “taken” to heaven against our will but actually we are asked to ascend by conquering its steps, the virtues one by one. God is there to protect us, to help us, same is the Theotokos, the guardian angel and the saints, but they can not climb in our place. Their intercessions and their prayers make the ascent easier but without our own will to climb we will not be lifted one inch from the ground. God has thrown down from heaven the ladder to bring us up, but he will not make us climb unless we want to. .
Second the ladder is not made out of indestructible steel and has no security features. It does not even have a hand rail, but is a tiny wooden structure that stretches across the sky in a very unbalanced way. All in all is not very appealing to the uninitiated. Who would like to climb on such an insecure ladder? This is why in order to safely walk on it one needs to be trained, need to be taught how to climb it, otherwise can fall and there is no safety net either. The Christian needs to be a skilled alpinist that developed his skills step by step through meticulous training. He needs strength, balance and overall an unmovable will to persevere in his training. Modern man lacks especially the latest. If we look at some statistics 90% of the people that join a fitness club quit within 90days. The reason: lack of motivation, unwillingness to commit and so on. It is hard to start something but even harder to continue. . Becoming a Christian is easy, to stay however one requires exercise. A Christian athlete needs to fast not just during Great Lent, but year round so when the fast comes his body is adjusted, and he will not end-up quitting after 2 weeks. He has to pray daily so when Sunday worship comes he doesn’t complains about how long the service is or how difficult is to stand or kneel. And we can go on and on. Without continuous exercise, without being spiritually fit all the time the ascent of the ladder is a dangerous enterprise and one can find himself shattered on the ground if worst comes for worst. .
Another characteristic of the ladder is that its steps are not even. Each step has a different height and that makes it even harder. We see this depicted in the iconography. But this is not all; curiously, to each person the same step may appear of a different height. Step one may seem 3 inches to me and maybe 10 inches to John. Why is this?. The steps represent the different virtues and for each of us they have a different personal hardship. For example the step of chastity would be difficult to climb for an adulterer. The step of humility would be difficult to reach for a proud and self-righteous person. Fasting would be difficult to achieve for one that likes to eat a lot and so on. For each one of us a particular step is the most difficult. A good spiritual exercise would be to find that one step in our lives and try to overcome it..
For all of us however there is one step on the very top that is the most difficult to reach. In St. John’s book it is identified as the step of love. Why love? For: [says the Apostle] “Do not commit adultery; do not murder; do not steal; do not bear false witness; do not lust;” and if there is any other commandment, it is summed up in this word, “You shall love your neighbor as yourself.” (Rom 13:8-9). The entire Gospel is comprised in this one word. In fulfilling this we fulfill our purpose in life. But it is a difficult thing to achieve. . Here is another story. One day an Elder was visited by three monks asking him for advice to see if they were on the right spiritual path. The Elder asked them what they do. The first said: I know the whole Scripture by heart. The second one said I levitate when I pray. The third one said I only eat once a week and then only some dry bread and water. The elder asked them: do you treat any stranger better than your blood relatives? They answered: No! Do you like more to be insulted than to be praised? The answer was again no. Then, said the Elder, go back and read the Scripture again because you have not understood them right. .
Love is the one thing that we struggle with: we cannot love our relatives, our neighbor, our friend and we don’t even want to mention our enemy. But God is Himself Love. He is a Trinity of persons that shows us the perfect model of love. The Father loves the Son and the Son loves the Father, and the Holy Spirit is the witness of this love. Without this third person that witnesses and shares this love the love is not complete.. In the same way in life we are always three, in the image of the Trinity: me, you and him. The third person is the one that completes and fulfills our love. By including him in our loving relationship our love becomes also complete. If let’s say I have a party and I invite John to participate because he is my dearest friend, but I tell him not to invite Peter, because he talks too much, in this moment the brotherly love I extend to John has being tainted by this exclusion and our love in Christ suffers. .
Christ died on the cross with his arms extended so he can gather together all mankind, so we should be one again, as brothers. We cannot come and be united with Christ through His Mysteries that we partake during Liturgy if we hate someone. How can we be united in Christ with a person that we hate? The commandment of love is therefore a pre-requisite for receiving the Sacrament of Communion. . This is the final and the steepest step and many stumble and fall off the ladder short of having a full understanding of God’s will in the world. A life long struggle can be forfeited if this commandment is not fulfilled. . The ladder of divine ascent comes now to an end. Let us remember the unstable equilibrium of our stairway to heaven. Let us recall that only the one that prepares and trains perseveringly will be able to climb to the top. The ladder is not for the faint hearted and is not for the unprepared. We are therefore due to continue the struggle to better ourselves through sustained preparation using fasting, prayer, humility and repentance as spiritual exercises so we can reach the measure of the fullness of the stature of Christ (Eph 4:13) for God is above all Love! Amin.